Fig. 1. 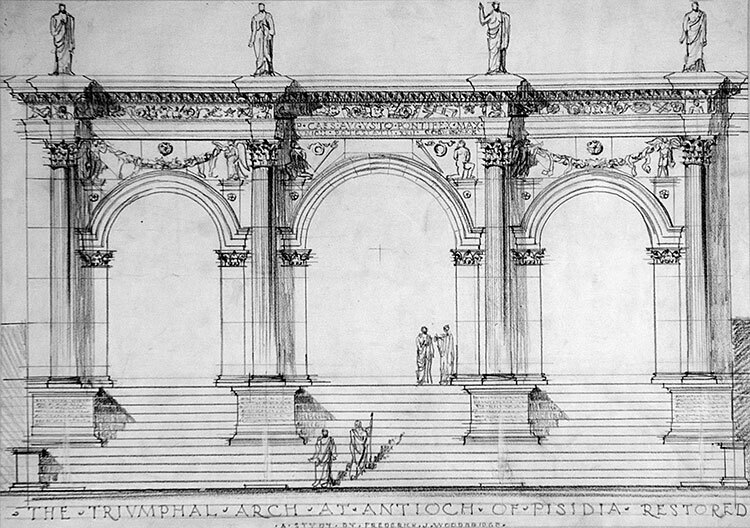 Preliminary restored elevation of the Arch of Augustus in Antioch, by Frederick J. Woodbridge, drawn ca. 1924 (F.J. Woodbridge, “The Triumphal Arch at Antioch of Pisidia Restored,” 1924, no. 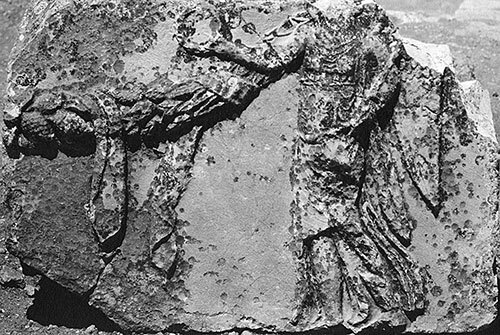 AAR 2447, Pisidian Antioch excavation archive, Kelsey Museum of Archaeology, University of Michigan; courtesy Kelsey Museum of Archaeology). Fig. 2. 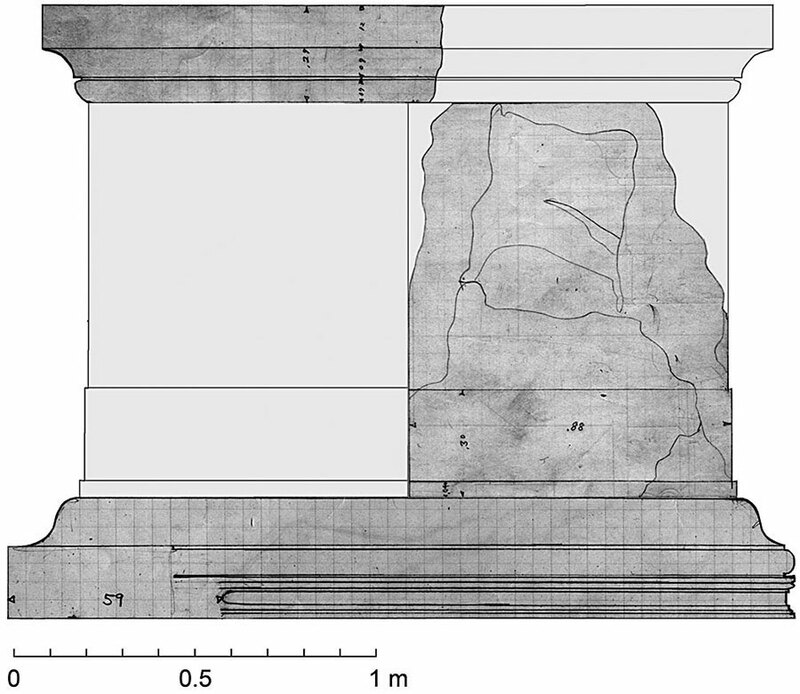 Woodbridge’s elevations of a large pedestal base, orthostat, and possible cap from the Arch of Augustus in Antioch, combined and restored by the author (after Woodbridge 1924, 68, 70; Colby and Woodbridge 1924, 35). Fig. 3. 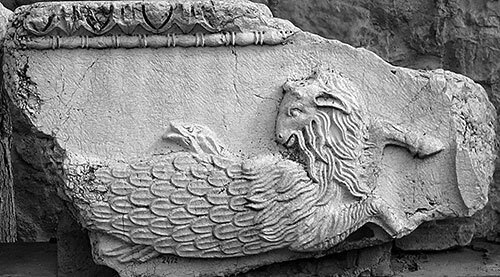 Frieze block from the Arch of Augustus with relief depicting Tritons flanking trophies (G.R. Swain, archive photograph, 1924, no. 7.1391, Pisidian Antioch excavation archive, Kelsey Museum of Archaeology, University of Michigan; courtesy Kelsey Museum of Archaeology). Fig. 4. 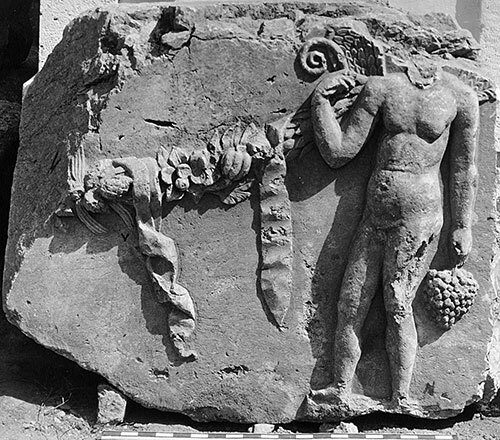 Spandrel block from the Arch of Augustus with a bound captive depicted in relief (G.R. Swain, archive photograph, 1924, no. 7.1275, Pisidian Antioch excavation archive, Kelsey Museum of Archaeology, University of Michigan; courtesy Kelsey Museum of Archaeology). Fig. 5. Spandrel block from the Arch of Augustus with a genius and garland depicted in relief (G.R. Swain, archive photograph, 1924, no. 7.1371, Pisidian Antioch excavation archive, Kelsey Museum of Archaeology, University of Michigan; courtesy Kelsey Museum of Archaeology). Fig. 6. Spandrel block from the Arch of Augustus with a Victory and garland depicted in relief (G.R. Swain, archive photograph, 1924, no. 7.1139, Pisidian Antioch excavation archive, Kelsey Museum of Archaeology, University of Michigan; courtesy Kelsey Museum of Archaeology). Fig. 7. Corinthian impost pilaster capital from the Arch of Augustus (G.R. Swain, archive photograph, 1924, no. 7.1387, Pisidian Antioch excavation archive, Kelsey Museum of Archaeology, University of Michigan; courtesy Kelsey Museum of Archaeology). Fig. 8. 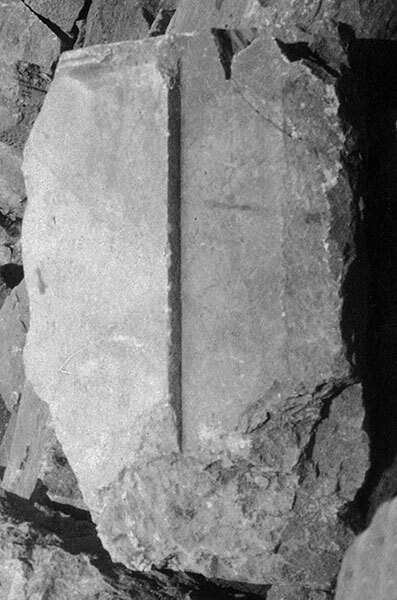 Pilaster shaft block from the Arch of Augustus (D.M. Robinson, archive photograph, 1924, no. KR048.12, Pisidian Antioch excavation archive, Kelsey Museum of Archaeology, University of Michigan; courtesy Kelsey Museum of Archaeology). Fig. 9. 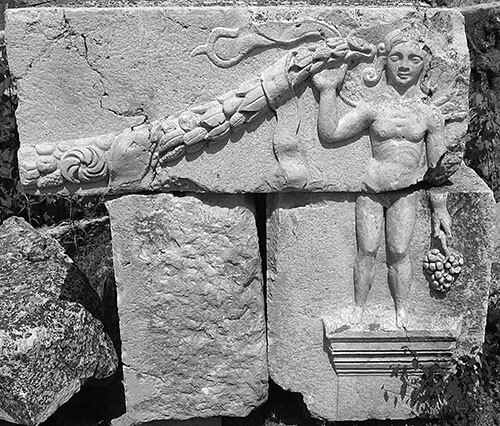 Frieze block from the Arch of Hadrian and Sabina with relief depicting Tritons flanking a trophy (G.R. Swain, archive photograph, 1924, no. 5.0232, Pisidian Antioch excavation archive, Kelsey Museum of Archaeology, University of Michigan; courtesy Kelsey Museum of Archaeology). Fig. 10. 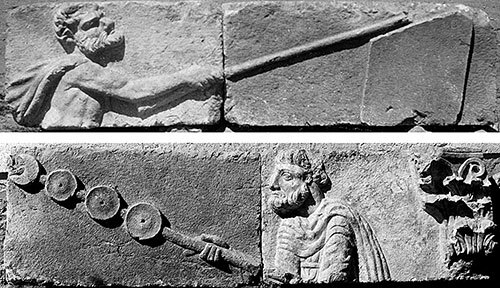 Frieze blocks from the Arch of Augustus with cuirass and quiver depicted in relief (G.R. Swain, archive photographs, 1924, nos. 7.1454, 7.1453, Pisidian Antioch excavation archive, Kelsey Museum of Archaeology, University of Michigan; courtesy Kelsey Museum of Archaeology). Fig. 11. 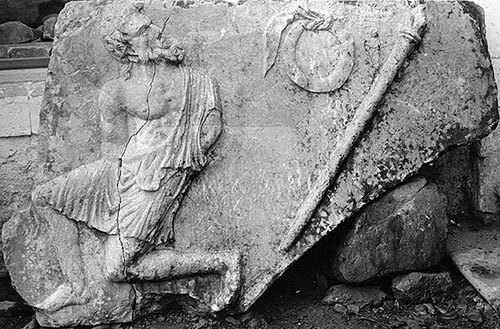 Frieze block from the Arch of Hadrian and Sabina with cuirass and quiver depicted in relief (G.R. Swain, archive photograph, 1924, no. 5.0224, Pisidian Antioch excavation archive, Kelsey Museum of Archaeology, University of Michigan; courtesy Kelsey Museum of Archaeology). Fig. 12. Frieze block from the Arch of Augustus with a Capricorn depicted in relief. Fig. 13. Frieze block from the Arch of Hadrian and Sabina with a hippocamp depicted in relief (G.R. Swain, archive photograph, 1924, no. 5.0213, Pisidian Antioch excavation archive, Kelsey Museum of Archaeology, University of Michigan; courtesy Kelsey Museum of Archaeology). Fig. 14. Spandrel block from the Arch of Hadrian and Sabina with a Victory and garland depicted in relief (courtesy D. Ng). Fig. 15. Spandrel block from the Arch of Hadrian and Sabina with a genius and garland depicted in relief. Fig. 16. 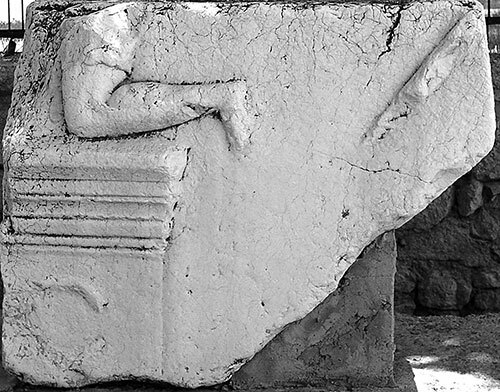 Spandrel block from the Arch of Hadrian and Sabina with the lower leg of a captive depicted in relief (courtesy D. Ng). Fig. 17. Spandrel blocks from the Arch of Hadrian and Sabina with reliefs depicting a Gaul and a Parthian returning Roman military emblems (D.M. Robinson, archive photograph, 1924, no. KR110.04; G.R. Swain, archive photograph, 1924, no. 7.1613, Pisidian Antioch excavation archive, Kelsey Museum of Archaeology, University of Michigan; courtesy Kelsey Museum of Archaeology). Fig. 18. Block from the Arch of Hadrian and Sabina with relief depicting a bucranium and garlands (G.R. Swain, archive photograph, 1924, no. 5.0223, Pisidian Antioch excavation archive, Kelsey Museum of Archaeology, University of Michigan; courtesy Kelsey Museum of Archaeology). Colby, H., and F.J. Woodbridge. 1924. “Measured Details from Antioch of Pisidia Made in the Summer of 1924.” Unpublished field notebook. Ann Arbor, Mich.: Kelsey Museum of Archaeology. Woodbridge, F.J. 1924. “Antioch of Pisidia: Measured Details of the City Gate, Temple of Augustus and Stoa, and the Propylaea (Arch of Tiberius).” Unpublished field notebook. Ann Arbor, Mich.: Kelsey Museum of Archaeology.